Many South Koreans cried during the march that started at City Hall in Seoul and some shouted anti-Japan slogans such as "Japan formally apologize!” and "Japan provide formal compensation! 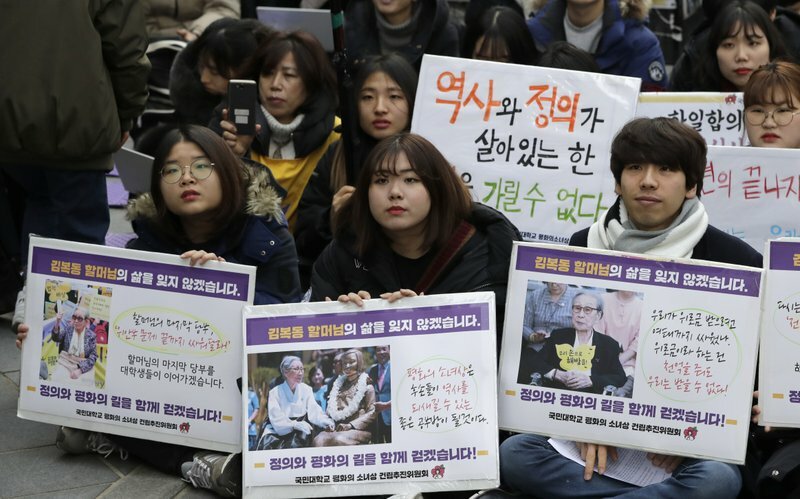 Hundreds of mourners gathered today near the Japanese Embassy in Seoul for the funeral of a South Korean woman forced as a girl into a brothel and sexually enslaved by the Japanese military in WWII. The mourners, dressed mostly in black on a bitterly cold morning and holding paper cutouts of yellow butterflies, followed a hearse carrying Kim Bok Dong that stopped in front of a bronze statue of a girl representing the thousands of Asian women experts say the Japanese military forced into front-line brothels as it pursued colonial ambitions. Japanese leaders have repeatedly offered apologies or expressions of remorse, but many of the women and their supporters want reparations from Tokyo and a fuller apology. Of the 239 Korean women who have come forward as victims, only 23 are still alive. Kim, who died at age 92 on Monday and had been suffering from cancer, had been a beloved leader of the protest movement, often sitting beside the bronze statue at weekly rallies that have been held since 1992 on a strip of sidewalk across from the embassy. As the limousine carrying Kim’s remains slowly rolled up to the statue today, mourners carried 94 vertical funeral banners that represented Kim’s age when counted in the traditional Korean manner and were marked with phrases thanking Kim and demanding Japanese reparations and remorse.